Our Miniature Horse Haulers were created and designed by Bob Kane. 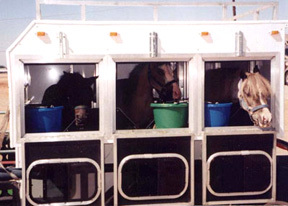 The are custom built and designed to fit your and your miniature horse's individual needs. Our goal is your satisfaction...guaranteed. Click the images below to see details about each design. Copyright © 2007 - Miniature Horse Haulers by Bob. All Rights Reserved.